Thank you for joining me this morning and for giving me an opportunity to share some perspective on our business and the significant opportunities we have ahead of us. Walmart started as one man’s dream 43 years ago, a courageous vision brought to life as we speak, by more than 1 million associates serving over 100 million customers every week. Sam Walton’s goal was simple, and yet when you think about it, radical: He wanted to help the people living in small towns and rural America enjoy a similar quality of life as those who lived in the big cities. While retailers were rushing to the suburbs, Sam Walton built a business serving these overlooked and under-appreciated customers. He knew intuitively this was right for the country, but also that there was a big business opportunity to provide this kind of value and service. Sam Walton’s dream to serve the under-served changed the world. His method was to go where other businesses feared to go. The other retailers of that time were convinced they wouldn’t make money in small town America. In other words, we didn’t get where we are today by being like everyone else and driving the middle of the road. We became Walmart by being different, radically different. Even with this great beginning, we have received our share of criticism over numerous issues, not the least of which is our size. To better understand our critics and Walmart’s impact on the world and society, we spent a year meeting with and listening to customers, associates, citizen groups, government leaders, non-profit and non-government organizations, and other concerned individuals. You might be surprised about what we heard. Many of these individuals and groups see things differently than we do, but they also have ideas. In fact many of our most vocal critics do not want us to stop doing business, but they feel business needs to change, not just our company, but all companies. We didn’t send a delegation or committee to meet with our critics. I met with them, so did Mike Duke, John Menzer, Doug Degn, John Fleming, Doug McMillon, Claire Watts, Eduardo Castro Wright, Rollin Ford, Tom Schoewe, Susan Chambers, Lawrence Jackson and others. Mostly we listened. And asked questions. And listened some more. You know, we are in uncharted territory as a business. You won’t find any case studies at the Harvard Business School highlighting answers for companies of our size and scope. If we were a country, we would be the 20th largest in the world. If Walmart were a city, we would be the fifth largest in America. People expect a lot of us, and they have a right to. Due to our size and scope, we are uniquely positioned to have great success and impact in the world, perhaps like no company before us. After a year of listening, the time has come to speak, to better define who we are in the world, and what leadership means for Walmart in the 21st century. Nothing brought this home more clearly than Hurricane Katrina. Katrina was a key personal moment for me. When Katrina hit last month, the world saw pictures of great suffering and misery. At Walmart, we didn’t watch it, we experienced it. Some of our stores and clubs were under water. associates lost their savings, their homes, and in a few cases, their lives. I spent time with a few of them in the Houston Astrodome. I saw the pain, the difficulty, and the tears. But I saw something else. I saw a company utilize its people resources and scale to make a big and positive difference in people’s lives. I saw how Jessica Lewis, the co-manager of our Waveland, Mississippi store, worked to help those in her community. When the flood surge swept through the store, it was a shambles. That night, though it was dark and flooded, she took a bulldozer and cleared a path into and through that store, and began finding every dry item she could to give to neighbors who needed shoes, socks, food, and water. She didn’t call the Home Office and ask permission. She just did the right thing. Just like thousands of our associates who also did the right thing, a trait I am proud to say is bred in our culture. During this time, we were asked by governments, relief agencies and communities to help. And look what happened. We were showered with gratitude, kindness, and acknowledgments. This was Walmart at its best. Katrina asked this critical question, and I want to ask it of you: What would it take for Walmart to be that company, at our best, all the time? What if we used our size and resources to make this country and this earth an even better place for all of us: customers, associates, our children, and generations unborn? What would that mean? Could we do it? Is this consistent with our business model? What if the very things that many people criticize us for – our size and reach – became a trusted friend and ally to all, just as it did in Katrina? Thankfully Katrinas don’t come around very often, but the world needs help all the time. People and the environment are being pushed to the limits. I don’t need to tell you how hard our customers work, and how hard it is to make ends meet. EDLP is not a catchphrase; it is a commitment to our customers – and one they count on. In the group meetings I referenced earlier, we talked about jobs, healthcare, community involvement, product sourcing, diversity, environmental impact: all the issues that we’ve been dealing with historically from a defensive posture. What became clear is that in order to build a 21st century company, we need to view these same issues in a different light. In fact, they represent gateways for Walmart in becoming the most competitive and innovative company in the world. Remember what I said earlier about Sam Walton? He had the courage and foresight to take on the hardest tasks in retailing instead of the easiest, and look what we were able to accomplish. Frankly, I thought the environment was the least relevant. We are recycling responsibly and we are not wasteful -- so a Walmart environment program sounded more like a public relations campaign than substance to me. But we kept talking, and as I learned more a light bulb came on for me ... and that’s a compact fluorescent light bulb! We should view the environment as Katrina in slow motion. Increasing greenhouse gases that are contributing to climatic change and weather- related disasters. Increasing air pollution which is leading to more asthma and other respiratory diseases in our communities. Water pollution which is increasing while safe fresh water supplies are shrinking; water-borne diseases causes millions of death each year, mostly among children. Destruction of critical habitat, causing unprecedented threat to the diversity of life, the natural world and us. And that’s just to name a few. As one of the largest companies in the world, with an expanding global presence, environmental problems are OUR problems. The supply of natural products (fish, food, water) can only be sustained if the ecosystems that provide them are sustained and protected. There are not two worlds out there, a Walmart world and some other world. That’s what we saw with Katrina: Our associates, customers and suppliers occupy the same towns, our children go to the same schools, and we all breathe the same air. These challenges threaten all of us in the broader sense, but they also represent threats to the continued success of our business. During Katrina, I was reminded of the vision and innovation of Sam Walton. We became who we are by serving the underserved. The smart folks predicted we’d lose our shirt with a discount store in a small town. There is another crowd of smart people who think that if a company addresses the environment, it will lose its shirt. I believe they are wrong. I believe, in fact, that being a good steward of the environment and in our communities, and being an efficient and profitable business, are not mutually exclusive. In fact they are one and the same. And I can show you why. 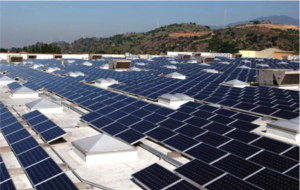 To be supplied 100 percent by renewable energy. To sell products that sustain our resources and environment. These goals are both ambitious and aspirational, and I’m not sure how to achieve them.....at least not yet. This obviously will take some time. But we do know the way. There is a simple rule about the environment. If there is waste or pollution, someone along the line pays for it. For example, if our trucks are inefficient from a fuel standpoint, we’ll pay for that at the diesel pump. If the dumpsters behind our stores fill up with trash, you can be assured that we paid someone to send that trash to us, and we will pay someone to take it away. You know, in the last 43 years our Walmart associates have become some of the most productive retail workers in the world. Why not spend the next four decades making our trucks, refrigerators, stores, lighting, packaging, shipping – every aspect of our business -- the most productive in the world? This will be good for the environment, it will save us money, and in some cases, it will actually add profits to our bottom line. 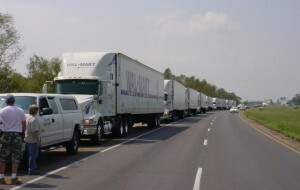 Who better than Walmart to make a kilowatt of electricity go twice as far, or a gallon of diesel take our trucks twice the distance? Or three times? Who better than Walmart to stretch our energy and material dollars farther than anyone ever has? To help lower our energy bills and gas prices for years to come? We didn’t just get needed goods to Katrina victims -- we did it less expensively than anyone. The environment is begging for EDLC.....for the Walmart business model. And if we do that, everyone will benefit. We have one of the largest private fleets in the U.S. At today’s prices, if we improve our fleet fuel mileage by just one mile per gallon, we can save over 52 million dollars a year. We will increase our fleet efficiency by 25 percent over the next 3 years and double it within ten years. If implemented across our entire fleet by 2015, this would amount to savings of more than 310 million dollars a year. Compare that to doing nothing. By being the leader, we will not only change OUR fleet, but eventually change trucks everywhere in the world. We will do ourselves a big favor, clean the air for our children, create new jobs, improve U.S. productivity, positively impact our country’s energy security, and more. There is a technological revolution going on out there with respect to buildings, heating, cooling, compressors, lighting, refrigeration and more. Walmart has always been a technological leader. And we are going to do it again with our stores. We want to eliminate 30 percent of the energy used by our stores. When we opened our McKinney, Texas store, we experimented with what we think we can do. There are solar panels generating electricity for the store, shredded tires for mulch, heating supplied by used cooking and motor oil, mature trees shading our buildings, and wind turbines. Our customers flocked to it and the store manager is enjoying nearly 10 percent energy efficiency gains versus a “normal” Super Center located a couple of miles down the road. While that is not enough to cover the cost of building the store, we are learning, and with our scale that will pay off as we introduce these technologies in new stores and clubs. Increasing our efficiency in energy not only reduces dependence on oil and saves money; it also avoids greenhouse gas emissions. We are looking at innovative ways to reduce our greenhouse gas emissions. This used to be controversial, but the science is in and it is overwhelming. Climate change doesn’t cause hurricanes, but hot ocean water makes them more powerful. Climate change doesn’t cause rainfall, but it can increase the frequency and severity of heavy flooding. Climate change doesn’t cause droughts, but it makes droughts longer. We believe every company has a responsibility to reduce greenhouse gases as quickly as it can. Reducing greenhouse gases at our existing store, club and DC base around the world by 20 percent over the next 7 years. Designing and opening a viable prototype that is 25-30 percent more efficient and will produce up to 30 percent fewer greenhouse gas emissions within the next 4 years. Increasing our fleet efficiency by 25 percent in the next 3 years, and doubling efficiency in the next 10 years. 2. Aggressively pursuing regulatory and policy change that will create incentives for utilities to invest in energy efficiency and low or no greenhouse gas sources of electricity, and to reduce barriers to integrating these sources into the power grid. 3. Assisting in the design and support of a green company program in China, where Walmart would show preference to those suppliers and their factories involved in such a program. 4. Initiating a program here in the U.S. over the next 18 months that would show preference to suppliers who set their own goals and aggressively reduce their own emissions. These commitments are a first step. To address climate change we need to cut emissions worldwide. We know that these commitments won’t even maintain our fast growing company’s overall emissions at current levels. There is more to do and we are committed to doing our part. Reduction of waste is our second goal and represents one of our most visible opportunities. Think about it....if we throw it away, we had to buy it first. So we pay twice, once to get it, once to have it taken away. What if we reverse that cycle? What if our suppliers send us less, and everything they send us has value as a recycled product? No waste, and we get paid instead. We are already doing this with existing equipment utilizing a new process called “sandwich balers” at 99 Sam's Clubs and 548 Walmart stores. Through this process, we are now recycling plastic we used to throw away. If all stores and clubs were on this program it would have added $28 million to the bottom line this year. This means working with our 60,000-plus suppliers and educating them. If it has to be thrown away, we don’t want it. We intend to reach the point in the near future where there will be no dumpsters at our stores, and no landfills with Walmart throwaways. To do that, we have to address packaging. Have you ever noticed that when you’ve taken the item out of the package you’ve got more packaging than item? We want to ensure that our goods come in the right size package, and we want to ensure that the materials in that packaging are made from renewable or recyclable materials that can make future packages. Pretty simple, really. And it saves us a lot of money. Our packaging team, for example, worked with our packaging supplier to reduce excessive packaging on some of our private-label Kid Connection toy products. By making the packaging just a little bit smaller on one private brand of toys, we will use 497 fewer containers and generate freight savings of more than $2.4 million per year. Additionally, we’ll save more than 38-hundred trees and more than a thousand barrels of oil. Again, think about this with Walmart’s scale in mind: this represents one relatively simple package change on ONE private toy brand. 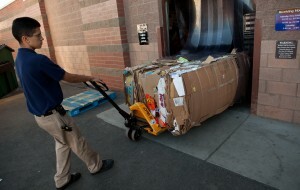 Reducing our solid waste from U.S. stores and clubs by 25 percent in the next 3 years. Working with suppliers to create less packaging overall, increase product packaging recycling and increase use of post-consumer material. Replacing PVC packaging for our private brands with alternatives that are more sustainable and recyclable within the next 2 years. After energy and waste, our third goal is built around the products we sell. Customers should not have to make trade-offs when they purchase products at our stores. You should not need a greater income for access to seafood, cotton, forest or paper products that are safe for your family or produced in a sustainable way. Let’s take cotton as an example. Did you know that a large percent of the 5 billion pounds of pesticides used every year are used on cotton? Those toxins don’t stop at the field, but can leach into the waterways, and may eventually find their way into animals, food, and children. Sam's Club introduced a yoga outfit made of organic cotton. It sold 190,000 units at 290 clubs in 10 weeks. We gave our customers something they wanted, but something they might not could have afforded at specialty stores. They snapped it up, and in the process eliminated two jumbo jets full of pesticides. The first organic product for Walmart will be a baby George organic offering. Walmart operations in the United Kingdom, Germany and Japan, along with the United States, are working to develop products that will be available next summer and priced like similar baby products. These opportunities are not limited to apparel; we are looking for opportunities in other product categories such as paper, food, fisheries and electronics. For example, in the area of seafood, we will certify all shrimp farms supplying Walmart in the U.S. according to environmental and socio economic best practice standards through third party accreditation. It’s better for our customers, it’s better for the world and it’s better for our company. Now, while I have spent the past few minutes talking about our environmental impact and commitment, I don’t want to leave you today without speaking about the other key areas I mentioned earlier: product sourcing, healthcare, wages, community involvement and diversity. In terms of product sourcing, we appreciate our impact and role as one of the largest purchasers of goods in the world. We are currently reorganizing our global sourcing organization to separate the factory certification function from our buying organization so that these two organizations can focus completely on their respective missions. We will continue to deepen our engagement and collaboration with industry, governments and leading community organizations on our sourcing practices in developing countries. We will continue our work with other multi-national companies to create a more proactive structure for enforcing and rewarding positive business practices, with a proposed plan to be announced within 12 months. In the interest of enhanced transparency, we are working towards an independent monitoring program to validate and provide additional credibility to our factory certification program. Healthcare is another key area for us and our nation, and we take seriously our role in making quality healthcare options more affordable and accessible to those who depend on us every day. We are committed to creating innovative programs for our own associates, and for our customers in the thousands of communities we serve. In addition, we are keen to play our part in developing solutions to the broader challenges with our national health care system. We will start by taking care of our own. Bring insurance within reach of all associates - by introducing a new value option plan January 1, 2006, with insurance coverage of $23 a month and kids covered for less than 50 cents per day....no matter how many children. Offer this plan for $11 a month, with children covered for less than 30 cents per day in some markets -- and we are working to offer these savings nationally. Increase the choice of plans and benefits offered, allowing us to better meet the needs of our diverse population. Provide the tools, education and incentives for associates to take more personal responsibility for their own health care spending and their own lifestyle choices. Establish basic health care clinics in our stores that bring greater convenience, access and price transparency. Leverage our scale and Sam's Club membership base to make healthcare insurance products more accessible to our small business customers and their employees. Thoughtfully apply our knowledge and resources to make real progress in reforming the health care system in America. We want to drive out as much as 25 percent of the cost in the healthcare system through leading a coalition of business, government and industry leaders in applying standards and technologies for efficiency. Similar to healthcare, our wage structure is another area that our critics have targeted. Last year we earned $10 billion in profits, so our critics argue that we should pay more to our associates. But I ask anyone to do the math. Even slight overall adjustments to wages eliminate our thin profit margin. Because we are so big, people forget that we have to compete. There are excellent retail competitors in every category we serve. When we look at our wages and benefits -- and theirs -- we almost always pay better, but that is also often overlooked or ignored in the public debate about Walmart. Be assured, we believe passionately in taking care of those whom we serve – our associates and working families. We are committed to paying competitively in every market, for both full and part-time positions. While we have made progress here recently, there is room for further improvement and our People group is now working on a process to bring better and more consistent standards to the pay rate review process at the local level. In the broader sense, there are global market forces at work flattening pay scales in the world. We are involved in that global market place and we believe it’s important to address the near and long term challenges our customers and associates face. For example, the U.S. minimum wage of $5.15 an hour has not been raised in nearly a decade and we believe it is out of date with the times. 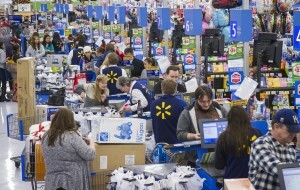 We can see first-hand at Walmart how many of our customers are struggling to get by. We have seen an increase in spending on the 1st and the 15th of each month and less spending at the end of the month, letting us know that our customers simply don’t have the money to buy basic necessities between pay checks. Given increasing gas prices and other economic pressures on our customers, the challenges will continue for many of them to support themselves and their families. While it is unusual for us to take a public position on a public policy issue of this kind, we simply believe it is time for Congress to take a responsible look at the minimum wage and other legislation that may help working families. We will engage in a community dialogue process that will include business unit leaders from operations, realty, store design, and construction. We will test this process in 3 markets over the next 12 months. The goal is to improve our existing community engagement process to find mutually beneficial partnerships with the communities we serve. To better understand and address local needs, we are opening local Corporate Affairs offices in many metro markets. We will continue to build “stores of the community” that use locally relevant store designs and blend with local architecture. We will adopt a siting and construction policy in the next 12 months that addresses environmental, social and historical considerations. Finally, on the subject of diversity, we have made great strides in this area over the past year – both in terms of program substance and measurement -- and I hope we can make similar strides in the key business areas I have just discussed. Continue to ensure that our hiring represents the diversity of our communities, and grow the percentage of women and minorities in our management ranks. Increase outreach to colleges and universities with large diverse enrollments. Continue to hold officers financially accountable by tying officer incentive bonuses to the achievement of diversity goals, including mentoring and participation in diverse organizations. Increase amount of business we do with minority companies using our size and leverage to create companies of significant size and stature. It is important that we be a company that is much more transparent with respect to our employment data. To that end, we will release information on the gender and racial make up of our workforce on a regular basis. You know, as I close, I hope you have a sense that this is a company on the move and, like Sam Walton, we are going to have the courage to lead and do what is right. Whether the environment, product sourcing, healthcare and wages, community involvement or diversity, we are investing in the future. We are a large company. For Walmart to be successful and continue to grow, we must operate in a world that is healthy and successful. Of course, we are acutely aware that we have a business to run, and run it we will. At the same time, we believe that these initiatives and many more to come will make us a more competitive and innovative company, and one that is more relevant to our customers. Again, for us there is virtually no distinction between being a responsible citizen and a successful business....they are one and the same for Walmart today. You may also be wondering to yourself, what is my individual role in all this....what do you want me to do....as a store manager or co-manager, as a merchant, a truck driver or a Home Office Associate? For now, I would just ask that you give some serious thought to what I’ve talked about today. I appreciate the fact that this is not a typical “call to action” where we are asking you to go do something by the end of the day or end of the week. Instead, please think about where you as an individual Walmart Associate, and where your store, club or work department can participate and make a contribution as we go forward in these areas. I would also ask for your patience as, despite our best intentions, I’m sure we’re going to make some mistakes along the way. Things will go wrong. Some associates may have trouble making the adjustment...some of you may be uncomfortable juggling the old with the new. So again I ask: what would it take for Walmart to be that company -- the one we were after Katrina...at our best...all the time? We have an aggressive vision. With courage and commitment to change, we will be at our best and remain true to the legacy of the company Sam Walton founded some 43 years ago.